Tom Hanks was never this cute. What can I say? It is just amazing. 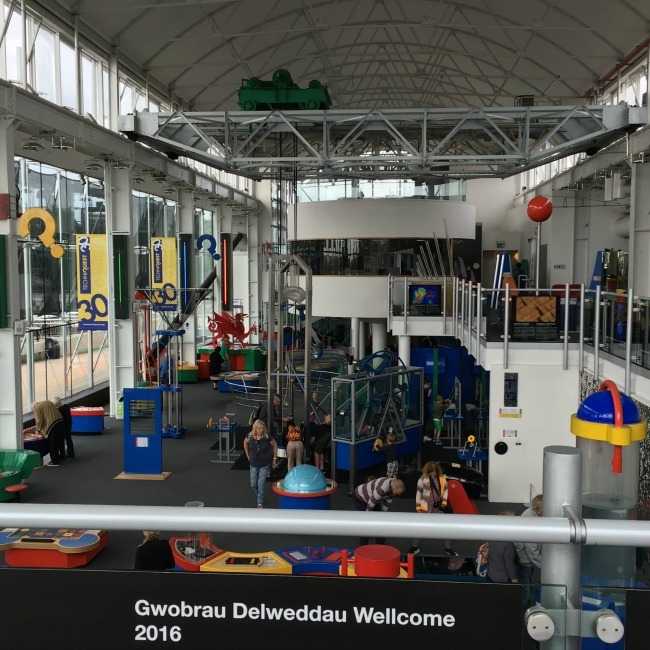 Techniquest* is a science and technology museum designed for children in Cardiff Bay. We had so much fun. 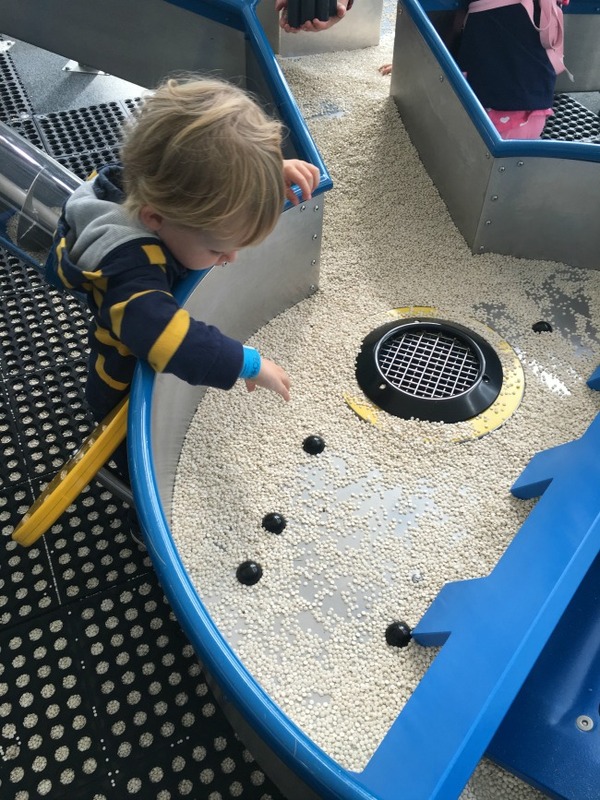 We were so lucky to be invited to visit as part of our A Toddler Explores series and we were not disappointed. We arrived soon after it opened at 10am and the children in front of us were unable to stand still in the short queue. Jiggling from one leg to the other, they just wanted to get in and play. That is what it is about, playing. 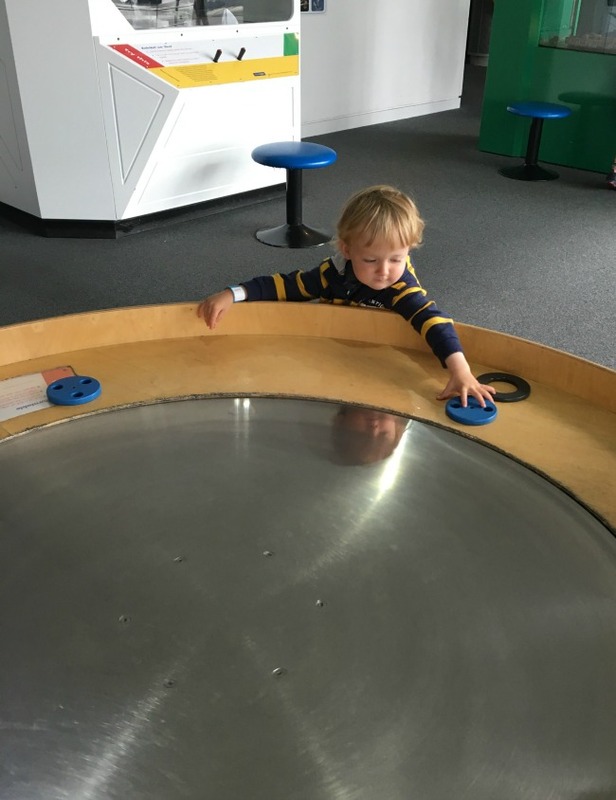 All the exhibits are educational, but in the best fun way ever. Nothing is out of bounds and there is so much to see and touch. We were given armbands to wear which allows unlimited access for the day. So you can spend some time here, pop out for lunch or a boat ride and come back later. We also booked into the Planetarium show of Pawprints in the Sky at an additional cost. Whilst I was booking in Bear had already run off into the museum and had found some metal rings that if you threw them they made a very loud noise! I'm not sure what it is but those rings make a racket when thrown onto it. 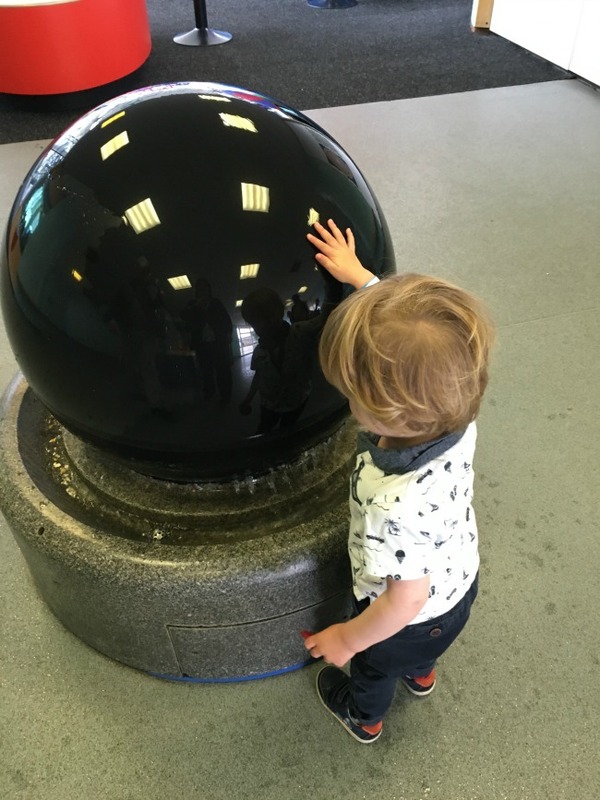 A toddlers delight. As I looked around I saw adults playing with the exhibits too, not a child in sight, this is fun for all ages. The museum is spread over two floors and is quite small, but don't let that deceive you. We were here for over two hours and only saw about a quarter of it. 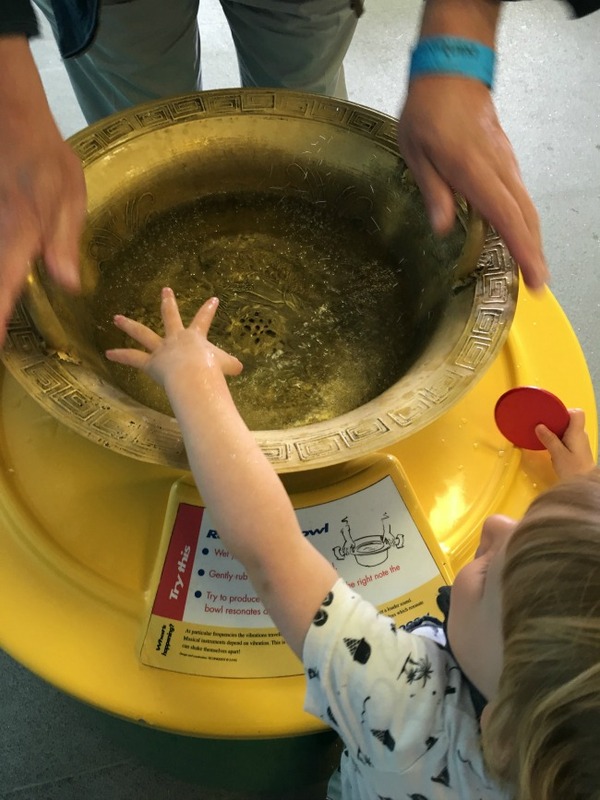 Every exhibit does something and needs interaction. A handle to turn, a button to press or a dam to be built. 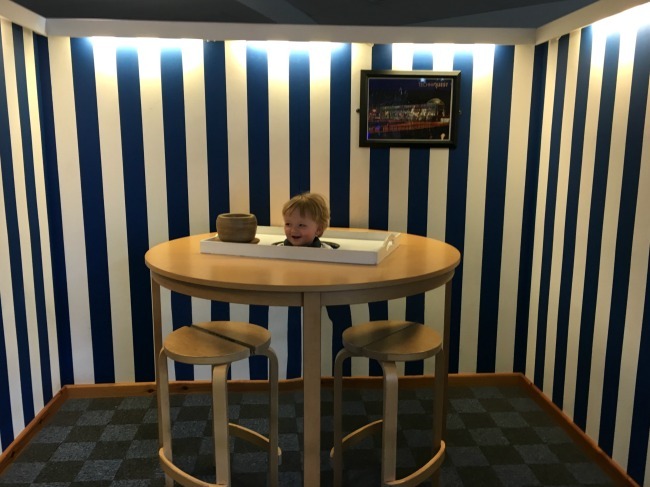 Can you spot the child? Some exhibits require collaboration. Like this one where lentils are raised by an Archimedes Screw or a bag on a lift and a reservoir filled. This is then scooped up and fed into tubes where it cascades down like a waterfall. Then the lentils have to be put through the mesh to start again. Bear is doing his bit albeit one lentil at a time. Lentils everywhere and no-one saying don't make a mess or don't touch. 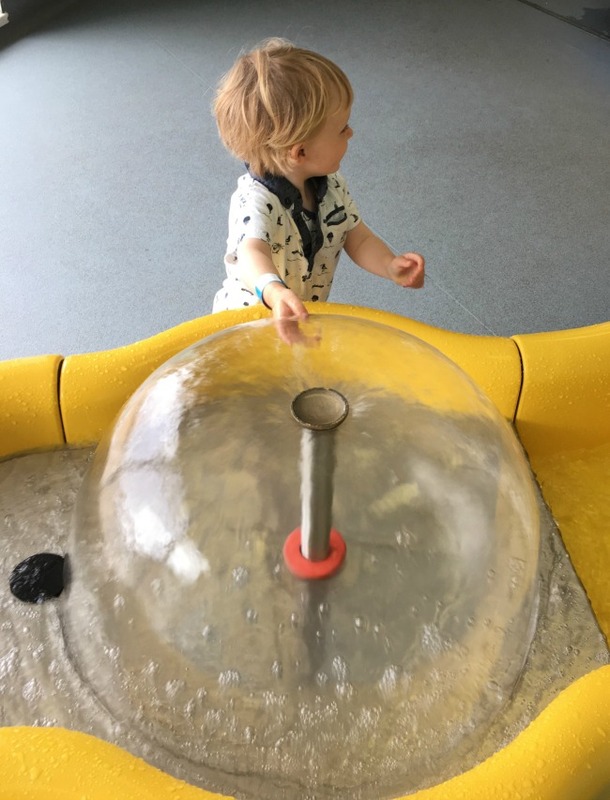 The balls are put into the vacuum tube and fall out into other tubes. This kept Bear entertained for hours, I need one. At the back of the hall are some water games. Fountains and streams and a big floating ball. It is designed to teach about water conservation and waste. Bear just loved getting wet. The theme is fun! Mirrors that make infinite reflections, a trick table. This is so funny you really must have a go. At 11.15 we were called for our show in the planetarium, Pawprints in The Summer Sky. This was the only disappointing thing for Bear. It is designed for children up to the age of seven and I think it was just a little too old for him, he's 22 months. The planetarium is small with circular seating and the show is projected onto the roof. I expected to see real stars but as it was aimed at little ones it was more like a comic. Bear was tired and hungry by now and only lasted about 15 minutes when he shouted to go. The slightly older children were enjoying the show that has a lot of audience participation. We stopped at the small cafe for a coffee and a snack. They sell a variety of drinks and snacks. 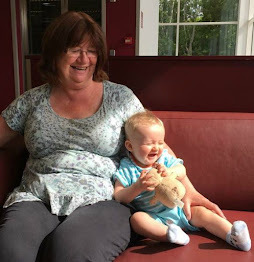 The museum is buggy friendly, although we left ours under the stairs as Bear was not going to sit down anywhere. 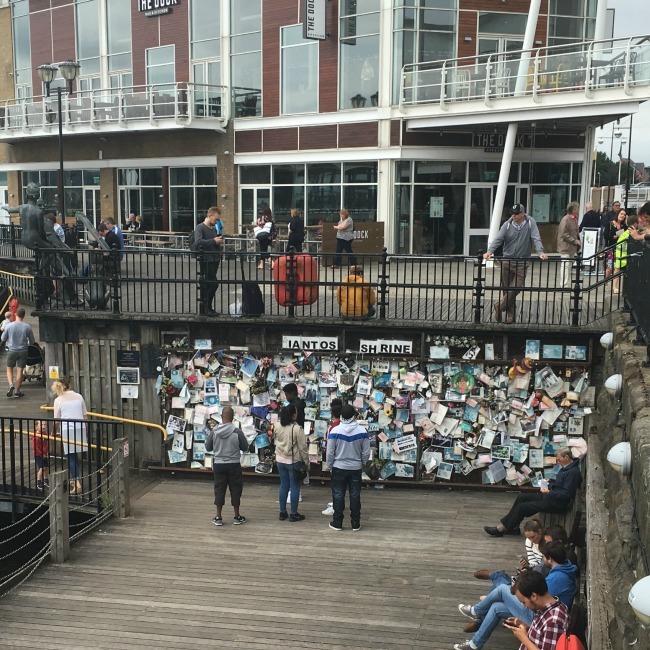 Being sited in Cardiff Bay there are good public transport links and so many other things to do. 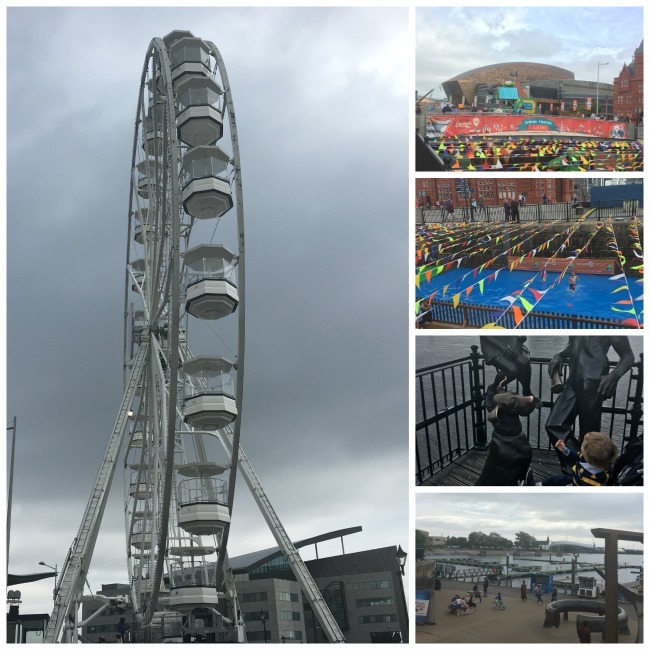 When we left Techniquest it was very busy and despite being a grey day Cardiff Bay was busy too. During the summer Cardiff Bay has a funfair, a beach and a splash pool. It is a great place to visit all year but summer is especially good. 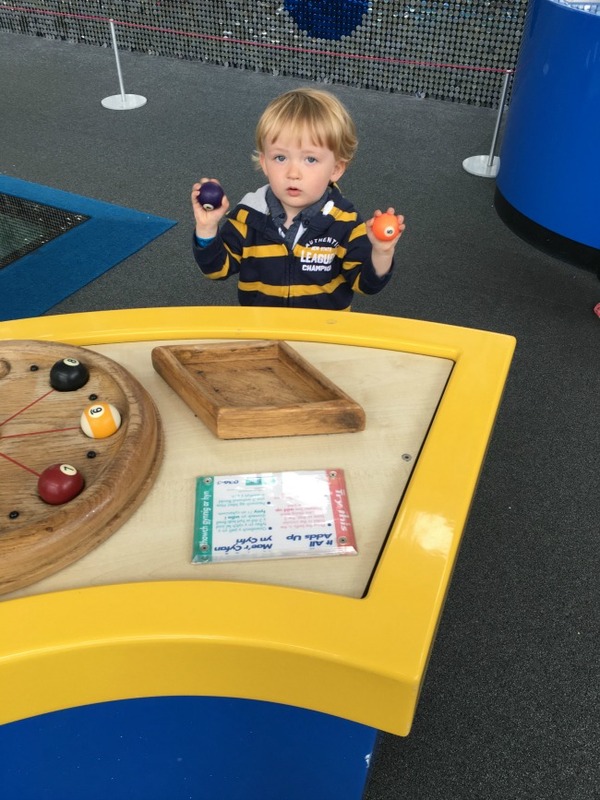 We loved Techniquest and would definitely go again. It was quiet when we arrived but by mid-day it was really busy, that is in the summer holidays on a grey day though. To get the most out of a visit and to miss the crowds, I would arrive early or much later. Don't forget to take dry clothes for your toddler, although Bear had dried out before we left. 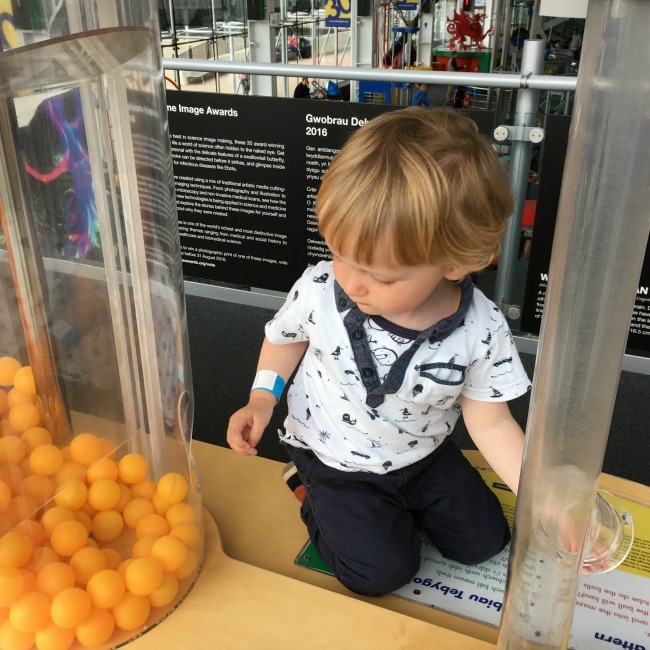 Until the 4th September they also have a show, Splendiferous Science, where the children can take part in interactive demonstrations and explore the most memorable and best-loved characters and events from Roald Dahl’s children’s books. This sounded like so much fun but Bear was tired and wanted his nap and I think he may have been just a bit too little. Entrance fees are Adults £7.50 and children over 4, £6.00. There are concessions and family tickets available. Throughout 2016 entrance on a Sunday after 2pm costs £3. Please check the Techniquest website for up to date fees, opening times and What's on. 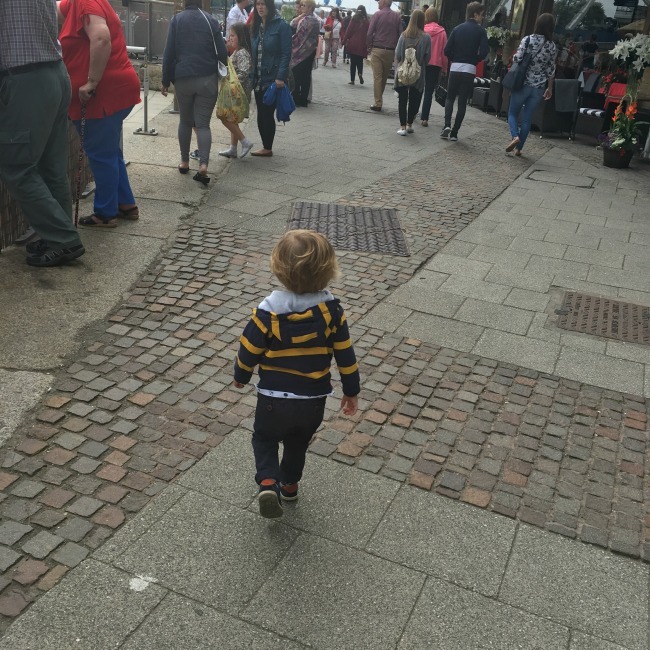 If you are looking for more things to do in South Wales, many free, have a look at my round-up post Places To Visit In South Wales With A Toddler. 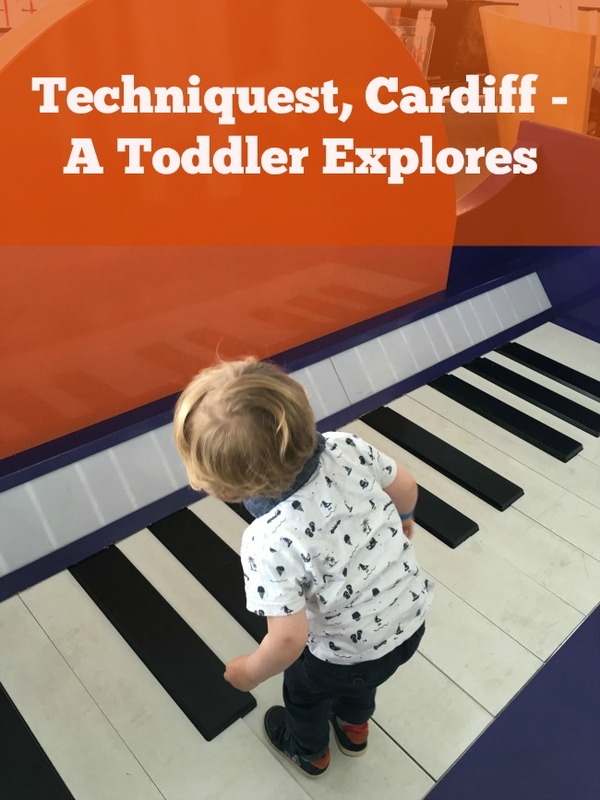 *We were invited to visit Techniquest for free for the purpose of this review. All opinions are honest and my own. basis, if so afterward you will without doubt take good knowledge.